The night began with Casey Roberts leading the way in Group A qualifying as he posted a time of 15.874 seconds around the 4/10 clay oval. 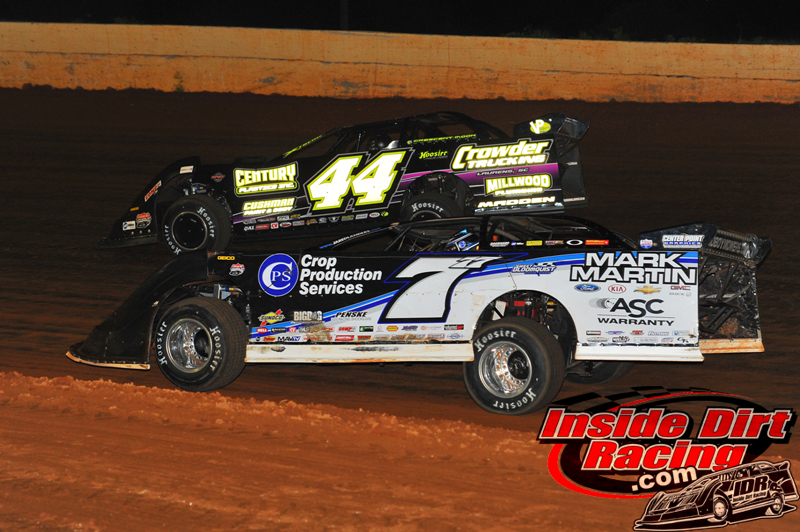 Mike Marlar, McDowell, Don O’Neal and Brandon Sheppard rounded out the top-5 in that group. 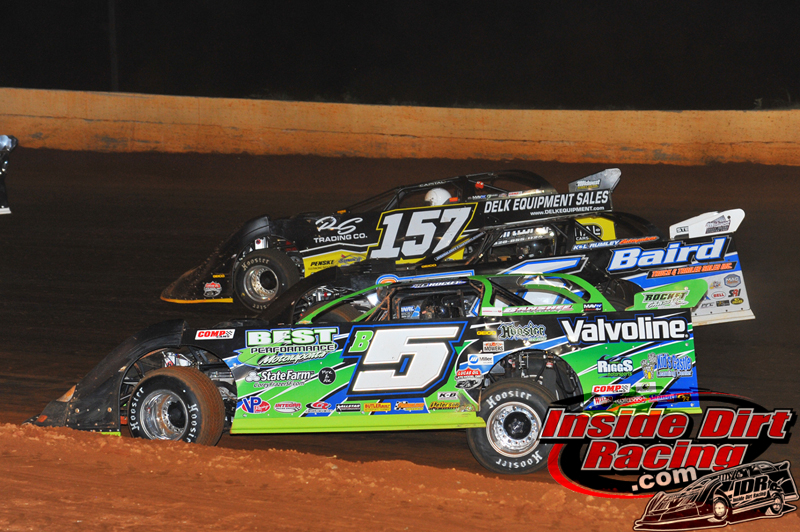 The Lucas Oil Late Model Dirt Series made its annual trek to the Smoky Mountain Speedway on Saturday evening and a veteran driver rode to the win in a brand new chassis. 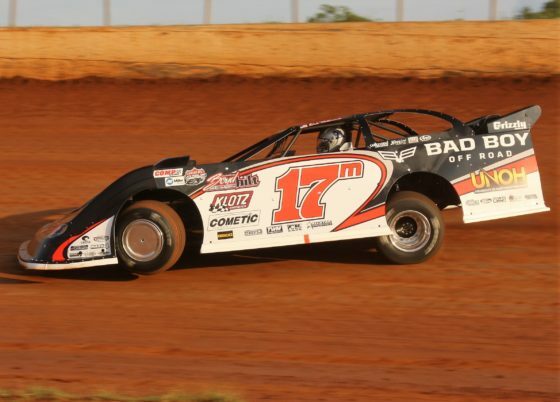 Dale McDowell cruised to the $12,000 win in front of a huge crowd in a Sweet-Bloomquist Chassis that had barely been completed before it was loaded into the hauler and brought to the Maryville, Tenn. facility. Another Sweet-Bloomquist Chassis, this one driven by Scott Bloomquist, set the quick time in Group B time-trials and overall with a lap of 15.679 seconds. Jimmy Owens, Jonathan Davenport, Chris Madden and Skip Arp made up the top-5 in that group. McDowell, O’Neal, Bloomquist and Owens won their respective heat races. Derek Ellis and Arp won the two B-main events used to set the remainder of the starting grid. McDowell fired from his pole position to immediately take the lead at the start of the 60-lap feature race with Bloomquist, Owens and O’Neal trailing. The racing was intense from 5th place back as cars scrambled in two and three-wide formation as they fought for position. That, in turn, allowed the top-3 of McDowell, Bloomquist and Owens to build some separation from the pack in a race that would run caution free during its first half. Tim McCreadie (39), Casey Roberts (101), and Jared Landers (777) in 3-wide action. During his time out front during those early circuits, McDowell built a relatively comfortable lead of about ten car lengths and seeming put the car on cruise control. However, as is often the case in a race that runs for a long stretch without a yellow flag, slower traffic would eventually become a factor. But even among the slower cars, McDowell was unfazed as he steered his new machine above on below those he intended to lap as Bloomquist and Owens kept the leader in sight, but never seriously threatened his grip on the top spot. At the same time, O’Neal had to battle with Madden and Landers to keep his grip on the fourth position over the course of several laps. The race’s first caution flag waved on lap 30 when the third running car of Owens dropped off the pace and eventually out of the race. On the ensuing restart, Landers was finally able to move up as he passed by O’Neal to capture third with Madden also taking a position away from O’Neal one lap later. Jared Landers (777) pressures Chris Madden (44). Lap 49 saw one of the early race favorites experience trouble as Madden appeared to blow and tire and slam into the third turn wall. That restart gave Landers the opportunity to move around his mentor Bloomquist to take the runner-up spot in pursuit of McDowell. 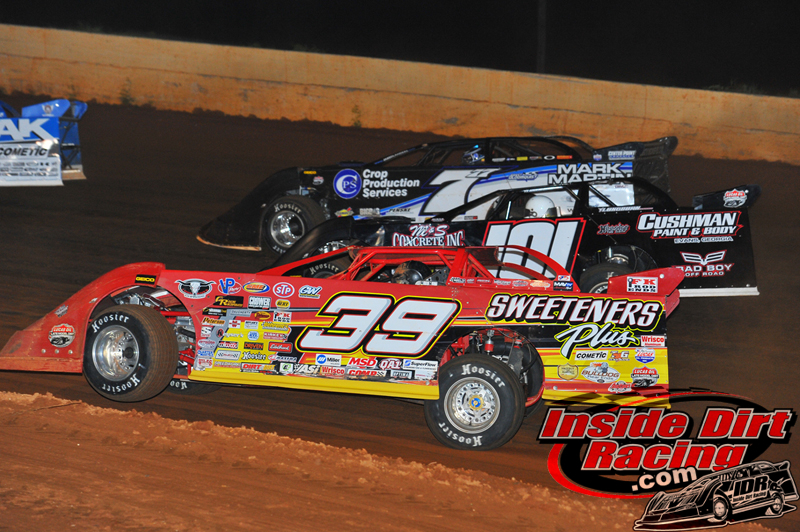 The race’s most serious caution flag came out on lap 50 when Marlar slid into the third turn wall while racing with Tim McCreadie for the fourth spot. O’Neal, Jonathan Davenport and Roberts were collected as they attempted to dodge the slowing Marlar car. More 3-wide action among Brandon Sheppard (B5), Jonathan Davenport (6), and Mike Marlar (157). From that point, McDowell would not be challenged as the Chickamauga, GA driver cruised on to the checkered flag. For those of you that are unfamiliar with our track layout, below is a description. Grandstand Gate is the FIRST Entrance coming From Hwy 411 South to Brick Mill Rd. Pit Gate is the THIRD Entrance and is actually Crye Rd. Tier Parking is a Tailgate atmosphere, where coolers and small grills are allowed. Parking is first come first serve and cannot be reserved. Please limit the use of tents and canopy’s unless you are on the back row. SEATING MAY BE TIGHT OR LIMITED; WE ENCOURAGE YOU TO BRING BLANKETS, CHAIRS..ETC (EXTRA SEATING WILL BE AVAILABLE ON THE HILLSIDE AND BANKING AREAS.) GRANDSTAND AREA WILL BE THE ONLY GATE OPEN. PITS WILL ONLY BE OPEN FOR MONSTER TRUCK DRIVERS/ CREW & DERBY DRIVERS/ CREW. THE PIT AREA WILL BE USED FOR MONSTER TRUCK RIDES.